Dogs are our bestest buddies, amiright? 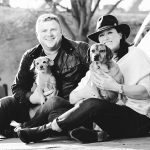 We have had the absolute pleasure of photographing hundreds of them over the years, and there’s nothing we’d love more than to photograph your pup(s) to add to our ever-growing WYTP family. Whether you are looking for a shoot in the beautiful outdoors, an indoor session in your cozy home or a studio-style session, we are happy to accommodate you! Cats are gorgeous, independent, loving and sometimes shy creatures. Having had the honor to work with many, many, cats in the past, including dozens of shelter cats, I totally get cat-ness. Whatever demeanor, likes or dislikes your particular kitty has, I have the patience to turn our session into a meow-sing success! Luckily, my gear includes lenses that allow me to get beautiful photos from a distance. Are you recently engaged? CONGRATULATIONS!!! Are you hoping to include your furkid in your wedding celebrations in some fashion but aren’t sure how? Well, look no further than a super unique and totally beautiful engagement or save-the-date session with WYTP! We absolutely love these adorable sessions and hope to help you celebrate this amazing time in your life with your furbaby(s)! Pet Photography Session with ADORABLE Fuzzy + Chiquita!!! New on the Blog: Our adoption celebration session with beautiful Sophie!! Hello dear friends! Last fall, we had the incredible honor of photographing BEAUTI-ful Delaware Valley Siberian Husky Rescue (DVSHR) foster girl, Sophie. Our session was a big celebration of very exciting news for Sophie. Click below to read and see all about it! WYTP’s photos featured on Pet Valu’s new dog food line! We are beyond thrilled to have our work featured on Pet Valu’s awesome new Perfortmatrin Ultra Grain-Free Senior Recipes Line. A few months ago, we were contacted to photograph gorgeous senior pup Lucy for the packaging of a new grain-free senior recipe that is specifically designed for seniors, promotes their overall health and addresses issues specific to their needs. Lucy made for a beautiful model during our session at Tyler State Park, and we think the photo that was ultimately chosen by Pet Valu is the perfect depiction of her beauty and wisdom. We are so grateful to have had this wonderful opportunity to work with Pet Valu & could not be prouder to have worked on this project. Need professional pet photography here in Denver?